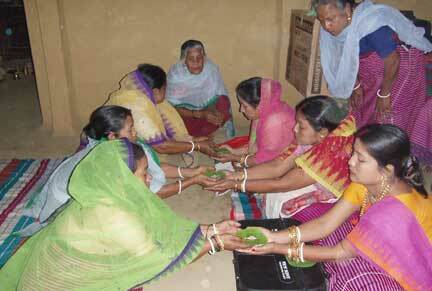 In Bishnupriya Manipuri society, the women were never neglected. Indian customs like widow-burning, dowry culture or devdasi system were never in practice in Bishnupriya Manipuri community. 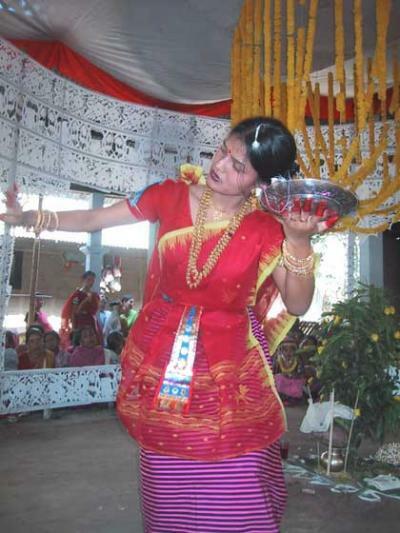 Goddess cults and myths in Manipur are very ancient and most of them prove the position of women in the society. After the propagation of Vaishnavism of Sri Chaitanya, the position of women became higher, as it is proved by the honor showed to them in religious rites like Birth rituals, Marriage ceremonies or Death rituals and in cultural observances such as ‘Kirtana’, ‘Rasleela’, ‘Vaasaka’ etc. An unmarried girl is referred as a ‘Ningon’ in Bishnupriya Manipuri Society. ‘Ningon’ acquires such a wide meaning as to cover the unmarried girls, the socio-religious ceremonies cannot be performed without the attendance of them. Even after their marriage they are very respectably invited by her sagei (clan) in every social or religious observance. In the traditional design of Manipuri house ‘Inchau’ – there is always a dormitory for the girl called Ningolpham. The role of women as a mother was, by far, the most important. Most respect was shown to het than to the father. The saying that ‘there may be a bad son but that we do not have a bad mother’ is so true in regard of Bishnupriya Manipuri community. Their sexual morality is above blame though they have been enjoying freedom and allowed to work outside freely with males. From the grand time down to the present, their activities are not confined to the four walls of domestic life unlike the Indian women who failed to attain even up to present day. They go out freely for purposes of petty trade mainly in the scale of products of their own hands. They weave fine and durable textures where colors are assembled in the most attractive manner. At the same time Bishnupriya Manipuri women have shown their gallantry and velour in desperate and critical situations. As a wife, Bishnupriya women struggle throughout their lives to bring a peaceful and prosperous family. But some women have been put in a heavy burden in the name of family life. They accepted the way they spend their lives after marriage without a question because it is an old tradition. The influence of Indian society has made such an impression that women should be obedient to her husband and in-laws without consideration right or wrong. Fortunately, these days, Bishnupriya Manipuri women are shining in the fields of education, because they are equally given the rights of education by the society and the families. Nowadays we can find lots of Bishnupriya Manipuri women are proving their excellence as professionals like Teachers, Doctors, Lawyers, Executives, Writers, Artists or Social workers. Some of the women came to challenging professions like journalism. Few of them have started making websites and writing ‘Blog’s in the internet. So we should be very proud of our Bishnupriya Manipuri women and wish to help to improve and transform them as sophisticated modern women as far as we can.